Grand Master Parisi says: “To be successful in the art of Qi Kwan Do, one must establish a flow of energy and power through the body and mind". Grand Master Parisi is the founder of Qi Kwan Do and has extensive knowledge of the martial arts. He has trained in boxing, Tae Kwon Do, Choi Kwang Do, Qigong & Chi Kung, is a Master of Chaikara-reiki-do and is a member of the Martial Arts Industry Association (MAIA) for his up to date knowledge of martial arts. Master Parisi regularly trains with martial arts experts from around the world in order to update and improve the Qi Kwan Do system. Grand Master Parisi is a member of the Amateur Martial Arts Association (AMA) which provides licensing insurance for every member, registered with the World Kick-Boxing Karate Association (WKA) for students who wish to enter competition. Master Parisi has also qualified with the Realistic Self Defence Association (RSDA). 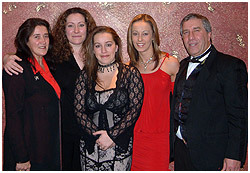 In 2003 Grand Master Parisi was Awarded the Combat Hall of Fame at a gala black te event at Aston Villa Football club for his contribution to martial arts in the UK and around the world. Grand Master Parisi spent two months in America teaching and attending seminars to further his already extensive knowledge of martial arts. He spent 1 Month in Florida at what was named the best Martial Arts seminar in the world. He also spent 1 month in Nivada. While Master Parasi was in America he also tutored the world renowned 'Pop Stars'. In 2013 Grand Master Parisi was granted the rank of Grand Master by the US Grand Master's Council. Master Parisi has had great joy and pleasure, over the past 23 years, of learning, studying and networking with some of the greatest masters in the martial arts. He has also spent countless hours reading, studying and attending seminars across the world to learn and better understand a variety of success systems and strategies that have worked well for others in a variety of areas. This has given him great insight, experience and wisdom beyond his years to be able to take others and himself to greater heights of success and achievement in the martial arts. Why are some people more successful than others? Why are some dojos so much more successful than others? Studying and networking with highly successful people in and out of the martial arts field gives Master Parisi an insight to certain qualities it possess. Whilst settling down to life in England, Master Parisi was trying out various styles of martial arts as a way of keeping fit and learning self-defence. Many of the styles he tried were found to be rigid, unrealistic and lacked much fitness training. There were also many students with injuries including bruises and broken bones, and in some cases lower self-confidence than when they initially enrolled.